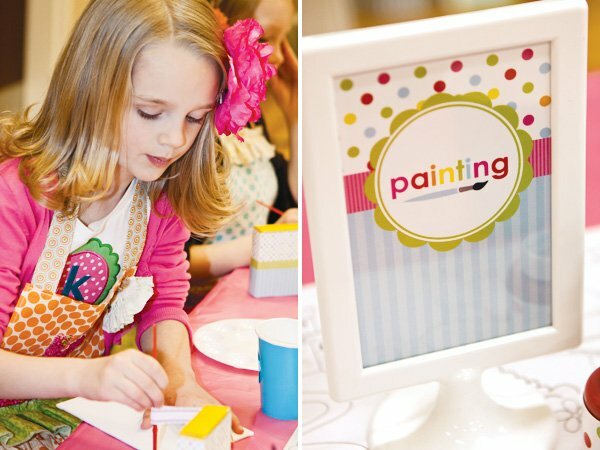 Jewelry making, painting, paper crafts & all the necessary supplies for budding Picassos! Even Picasso couldn’t have painted a more picture-perfect party for one art-loving little girl. 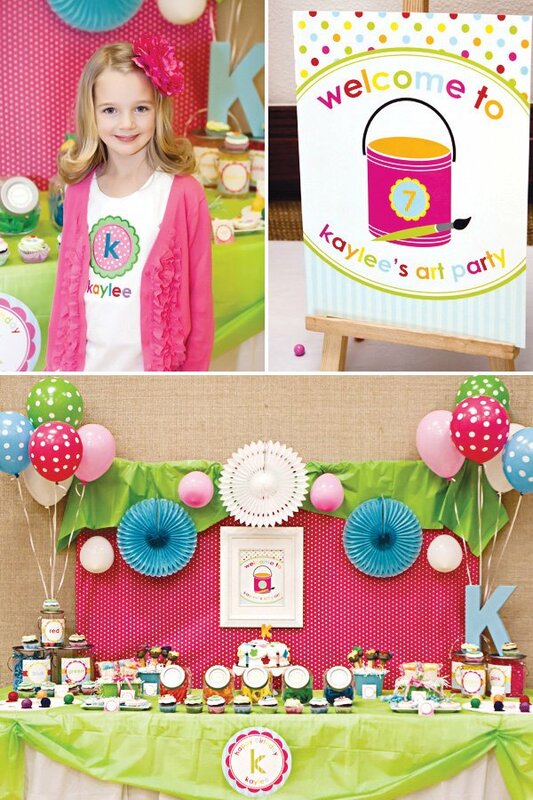 My daughter, Kaylee, has been begging for an arts & crafts birthday celebration for an entire year! Some children are born with silver spoons in their mouths. Kaylee was born with a paintbrush and crayons in her hands! Kaylee (the resident artist!) wore a custom monogrammed birthday shirt from made by morgan! 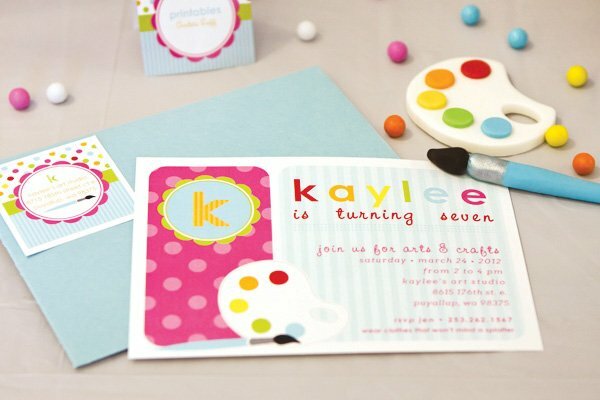 Ten little friends were invited to come paint the town at Kaylee’s Art Studio in celebration of her 7th birthday! What little girl doesn’t love crafting the day away? After all, Picasso himself said, “Every child is an artist.” Maureen designed darling invitations & matching address labels. We hand made envelopes from coordinating cardstock when we couldn’t find any in the right color for purchase. Need to make a coordinating envelope? Carefully take apart an old envelope in the size needed. Use it as a template and trace around it onto the paper color of your choice. (I stapled several sheets of cardstock together and only traced the pattern on the top sheet and cut them all out at once.) Then use the template to help you create and score fold lines. Use your favorite adhesive to finish assembling. Darling ruffled art aprons were uniquely crafted by the talented Monica, of Sook Ee Designs. 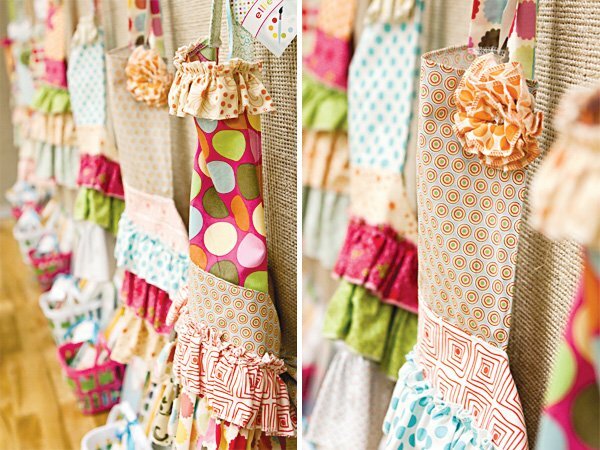 Upon arrival, the girls each got to go find their aprons hanging from a cute clothespin display on the wall. 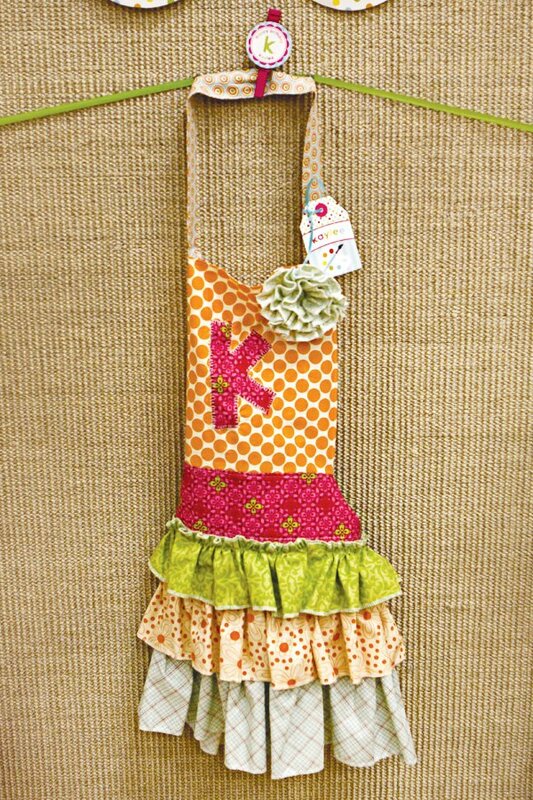 Each little apron had a coordinating personalized hang tag attached for easy distribution. 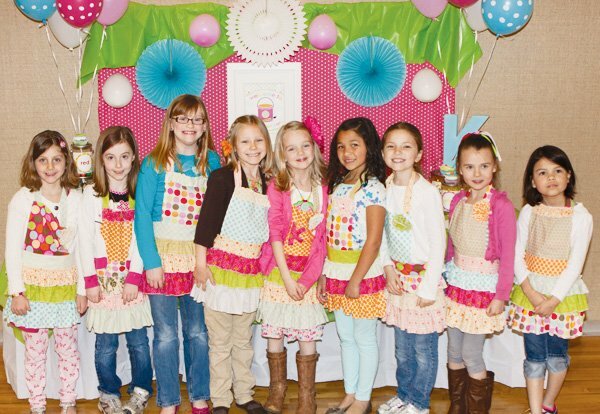 The girls were giddy with delight, upon realizing they got to keep the aprons as a party favor! 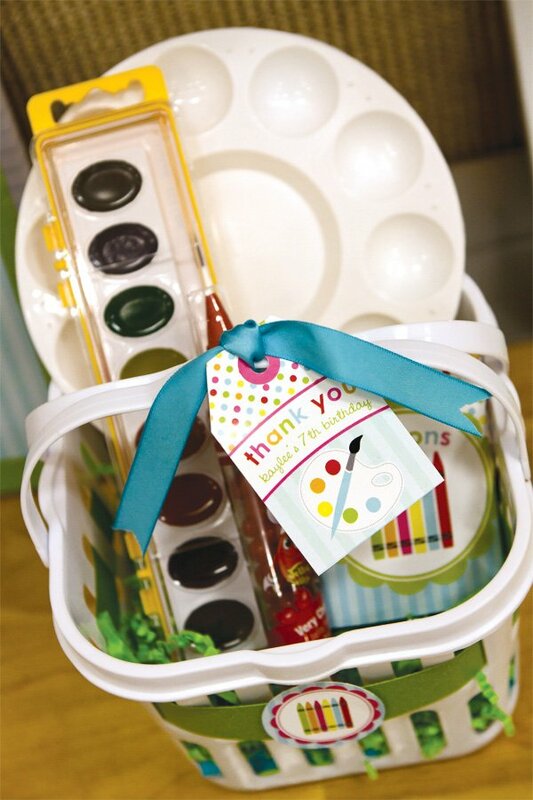 Below each apron sat personalized art supply kits for every aspiring artist. 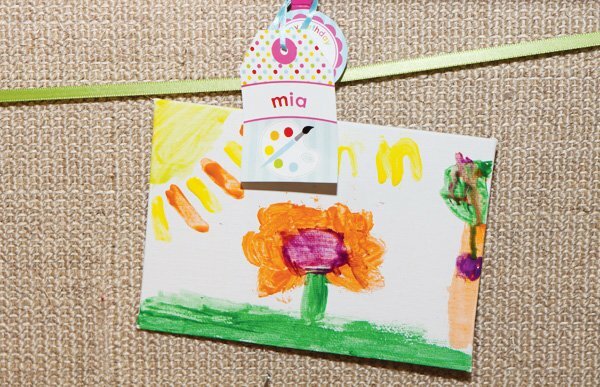 Each art kit included an unbelievably cute personalized sketch book, water colors, paint palette, darling printable wrapped crayon packs, art canvas and a fun little crayon shaped container of jelly beans. Anders Ruff designed the crayon wraps and personalized sketch book covers at my request, as well as the cute little ‘thank you’ hang tag that hung from the handles of each basket. The art supply kits served 2 purposes, acting as the supplies needed to complete some of the party activities and as a favor the girls got to take home with them. We picked up the art kit supplies for Kaylee’s party last summer during back-to-school sales and just stored them until it was party time! What’s an arts and crafts party without arts and crafts? Thankfully, Kaylee’s guests will never know! 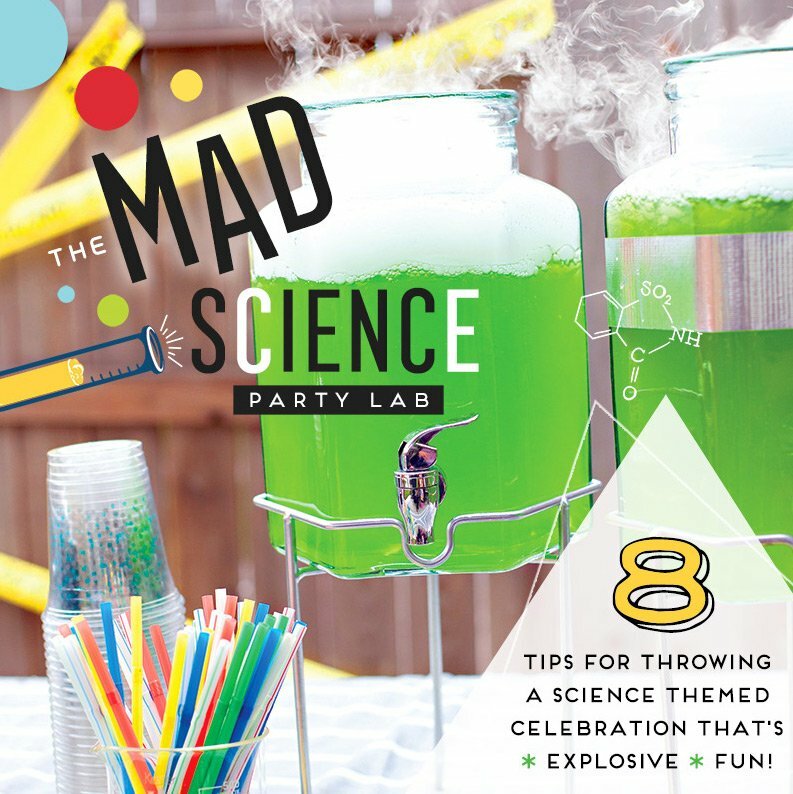 The party was full of fun activities that allowed each party-goer plenty of opportunities to be creative. Four main arts & craft stations were set up for party guests to rotate through. 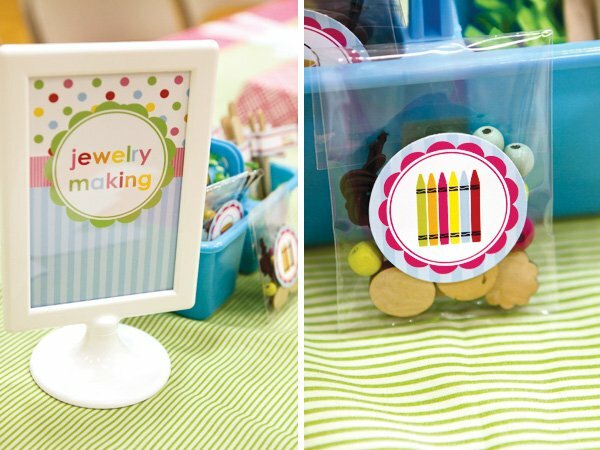 I had Anders Ruff design personalized station signs that marked each crafting area. They were so helpful in dividing the group and keeping the proper supplies in each area. Painting & Drawing: The painting & drawing table was covered in a disposable pink table cloth and covered with a ‘runner’ comprised of a roll of coloring scenes. 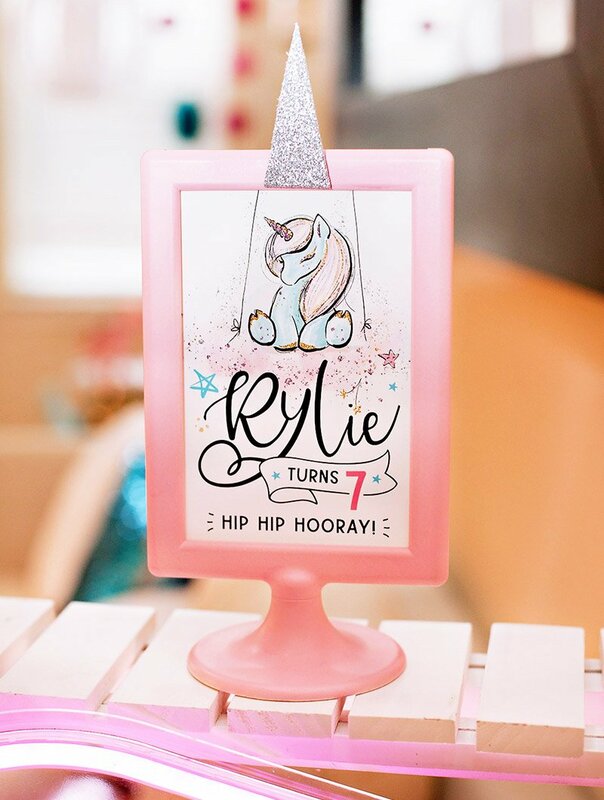 (You can find these in a variety of themes at Michaels! They come in a long butcher-paper like roll that can be cut to any length.) I set out supply buckets containing Crayola washable paints, tiny paintbrushes, water cups for cleaning paintbrushes & colored pencils. 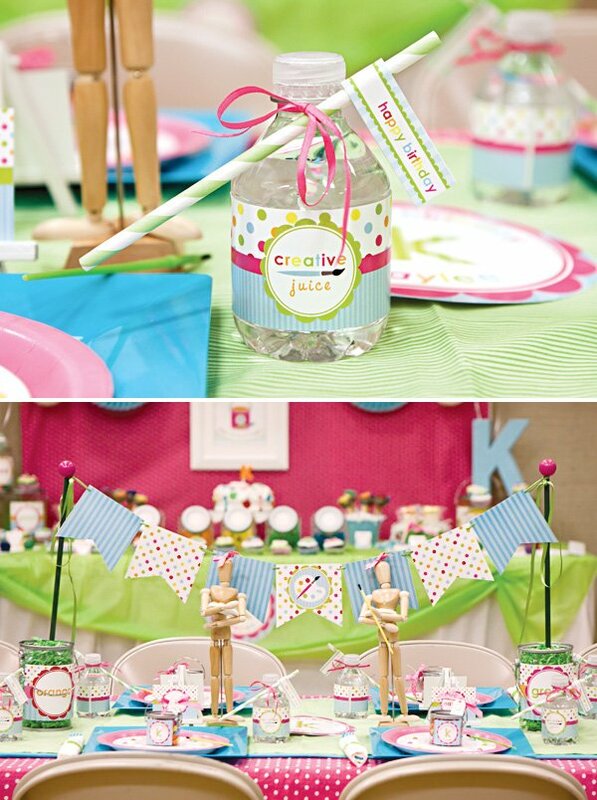 (Notice the cute coordinating Anders Ruff party flags, party logos & designer papers used to dress up the supplies? 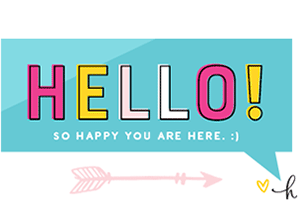 Those are all part of the ‘Polka Dot Arts & Crafts Printable Package found here.) Our little guests used their crayons to color the runner & draw in their sketch books. Those who weren’t drawing & coloring were painting! Paint was squeezed onto their round paint palettes and each girl created a masterpiece of her own on her art canvas. We hung the finished artwork up to dry for all to admire from the same clothespin display that we had used earlier to hang the aprons. The personalized hang tags that had previously been used to designate each girl’s apron, now served to mark each girl’s masterpiece. (This helped so much at the end of the party when fellow moms were helping to distribute everyone’s masterpieces to go home!) I loved how cute the clothespins looked with a coat of paint and a party logo attached. 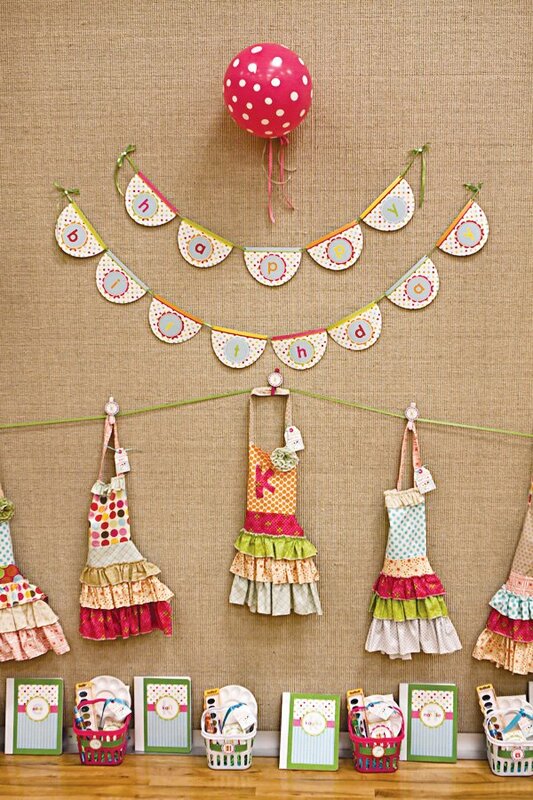 Details make parties so much fun! At the end of the party, the girls voted on their top 5 masterpieces and the winners went home with a chocolate art palette. These were created from a candy mold, using white melting chocolates. I then used candy dots from the famous Dylan’s Candy Bar in NYC to create the paint splotches. My clever husband figured out that by dabbing a tiny drop of water on the back of the candy dots helped them to adhere to the chocolate without coming loose! These art ‘awards’ were packaged up in cellophane bags and ‘Edible Art’ treat toppers. We also played the drawing game, “Pictionary” . The girls had so much fun drawing and guessing pictures created with wipe off markers on little hand held white boards. 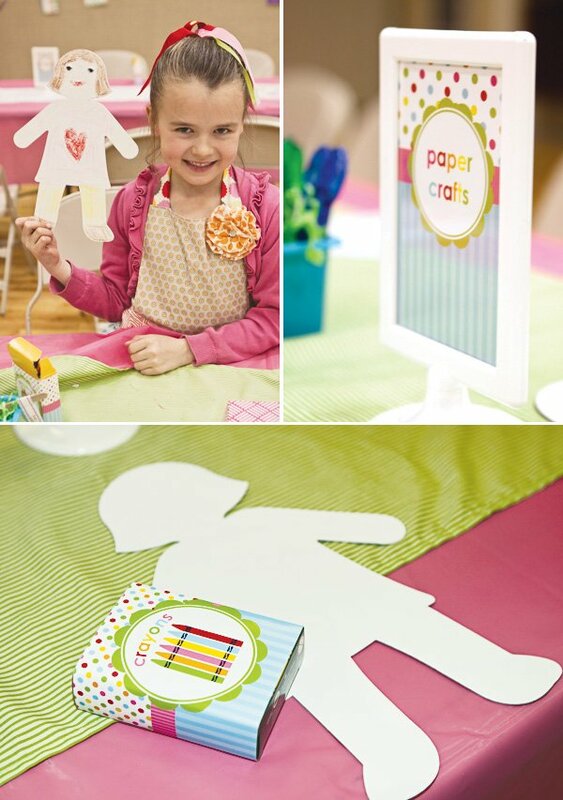 Paper Crafts & Jewelry Making: As a child, I remember loving to play with and decorate paper dolls. Jumbo cardboard paper dolls (purchased from Michaels) were set out for each of Kaylee’s guests to decorate. Cute sticker eyes & eyelashes were available for the girls and made their dolls extra cute. While one half of the table was busy designing & coloring their doll clothes, the other half was enjoying making necklaces and bracelets. I bought a darling little American Doll jewelry making kit that contained all the supplies needed to put together jewelry kits for each of the girls. I repackaged the kits for the girls & dressed them up. The girls got to use the colorful beads and wood accents, along with some fun rub-ons to create a unique piece of jewelry to take home. Starving Artist’s Dessert & Dining Tables: All starving little artists need lots of sweet treats to keep the creativity flowing. 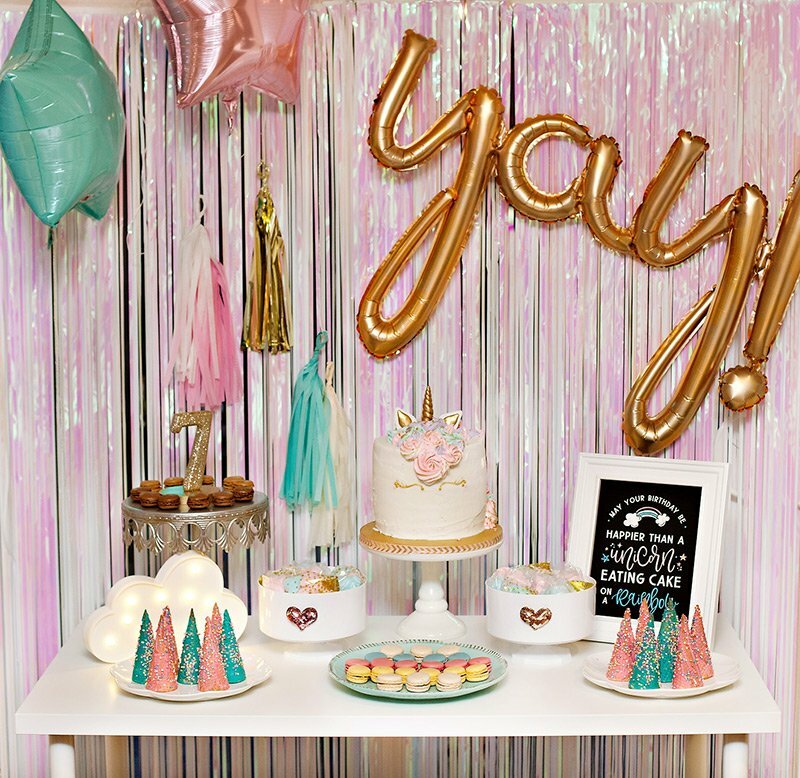 Both the dining and dessert table were created with a little girl’s art studio in mind and were overloaded with bright, colorful art-inspired treats. I just loved the bright colors of the printable graphics packageand tried to capture the fun of the polka dots and stripes through my tabletop & background fabric choices & tablerunner (made by Vivian of Kerr Kreations). 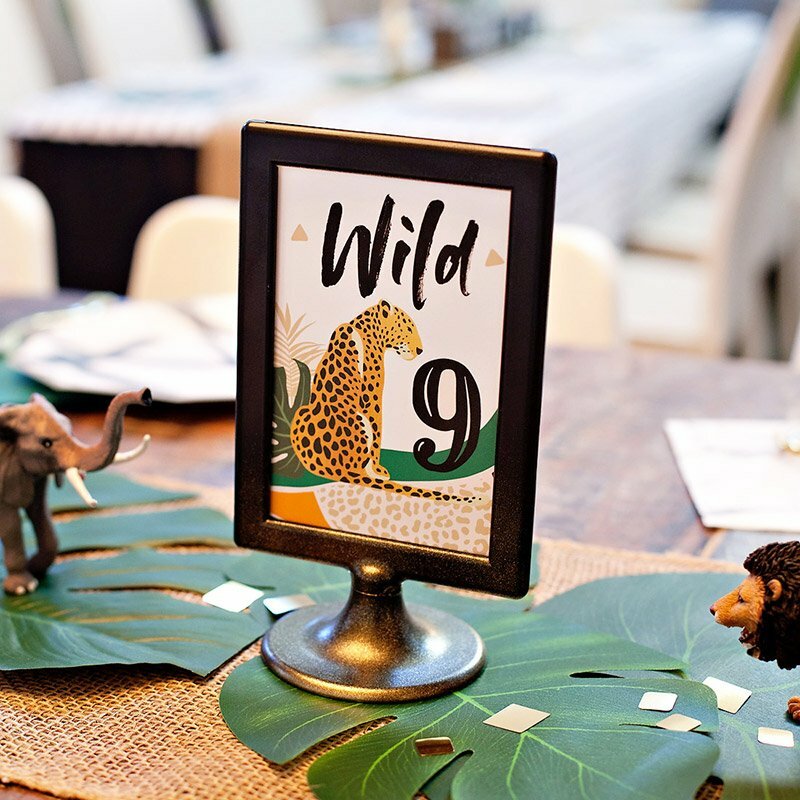 The dining table centerpiece banner was made from the striped & polka dotted coordinating patterned papers from the printable package. I simply fastened them to wood dowels using some green ribbon and anchored them in dolled-up paint cans, filled with paper shred. 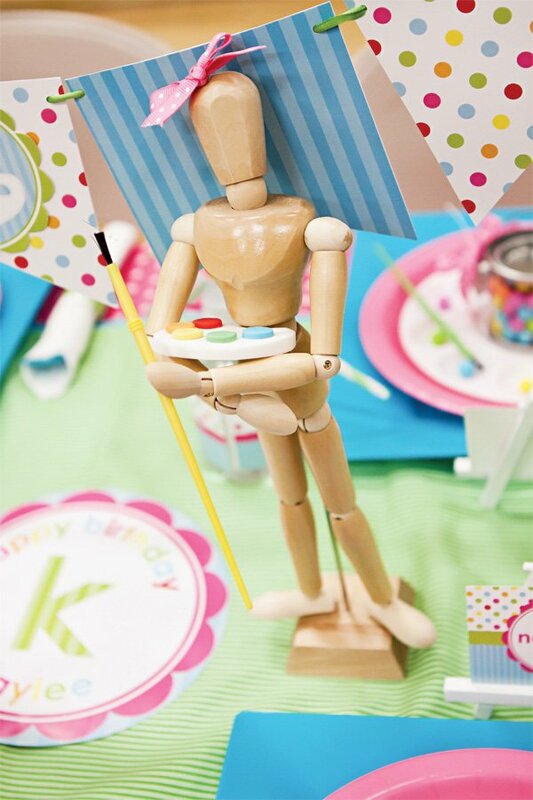 Wooden art manequins held paintbrushes and adorable fondant artist palettes made by the ever-so-talented Lynlee, of Lynlee’s Petite Cakes. The place settings at each table were so fun and colorful. By layering an aqua charger, hot pink plate & a white artist palette, several fun colors were mixed to draw in the eye. 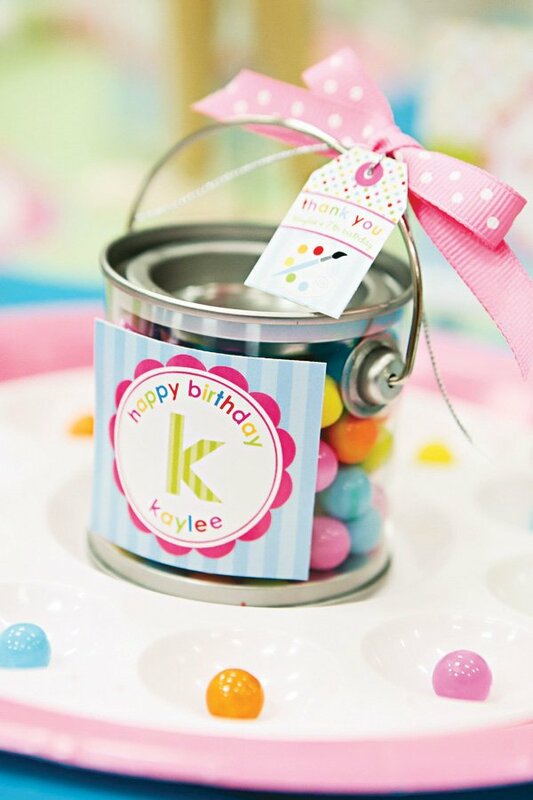 Each place setting was topped off with a mini paint pail favor, adorned with a party logo & mini thank you hang tag. 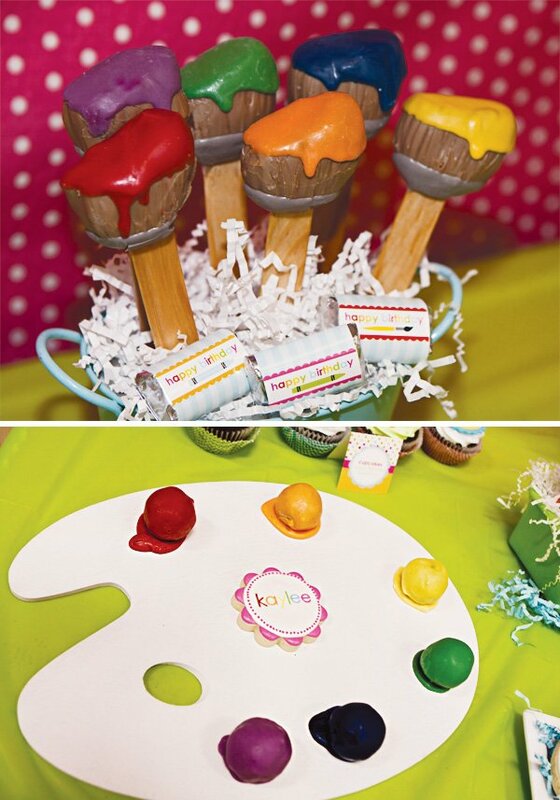 A pop of color was added to each art palette with coordinating Sixlets candies and a decorative paintbrush. Spray painted art easels held placecard holders for each guest. Napkin rings were fashioned from strips of paint swatches in coordinating shades of blue & green. Water bottles were dressed up with ‘creative juice’ wraps, ribbon and striped straws from one of my favorite party supply vendors, Hey Yo Yo. The colorful dessert table was full of delicious eye & palate pleasing treats, masterfully created by some of the most talented dessert artists. 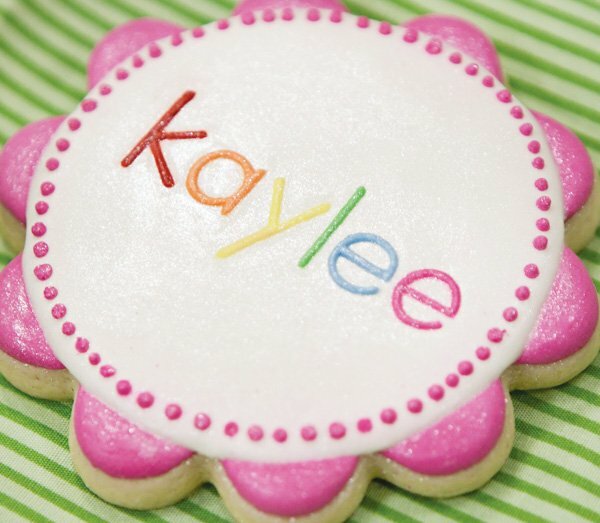 From the beautiful fondant work of Lynlee’s Petite Cakes seen on both the cookies and cake, to the draw jopping paintbrush and paint ball cake pops by Lil Cutie Pops to the stunning paint palette, party logo and paint tube cookies by JP Creatibles, our little artists had plenty to be excited about! 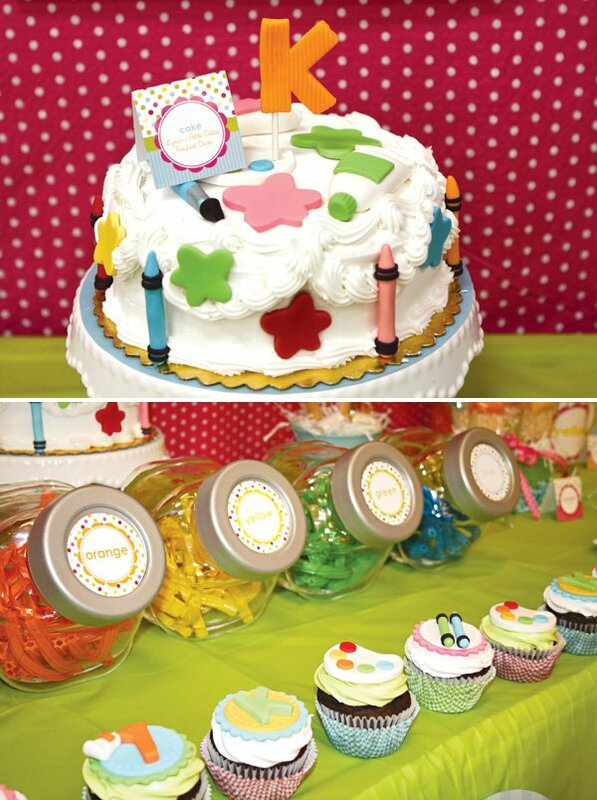 I wanted the dessert table to be filled with edible art tools for our little artists! I achieved the look by using spray-painted wood art palettes, art supply buckets and paint pails at various levels to house and serve our treats. In addition to the gourmet treats provided by the wonderful businesses above, I also served Rice Krispy paintbrushes & color coordinating gumballs and licorice in a variety of flavors. Of course, the cake and cupcakes were a crowd pleaser as well! My talented friend, Rebecca of Mi Vida Photography, captured the fun perfectly! Oh I love this party!! 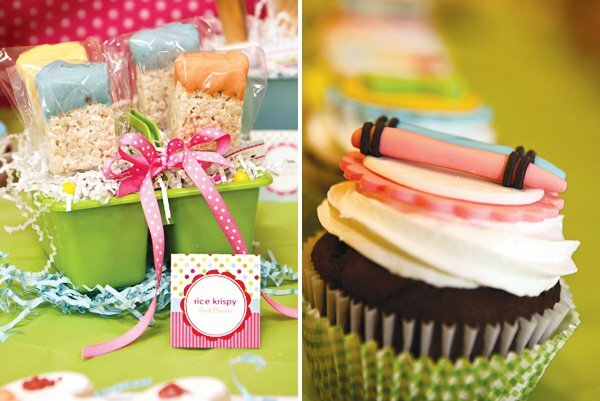 The sweet treats designed like paint tools, the adorable aprons, the favors and of course the amazing printables! Great job!! This party is so amazingly creative. I love all of the concepts and how they have been executed. Well done it is lovely. 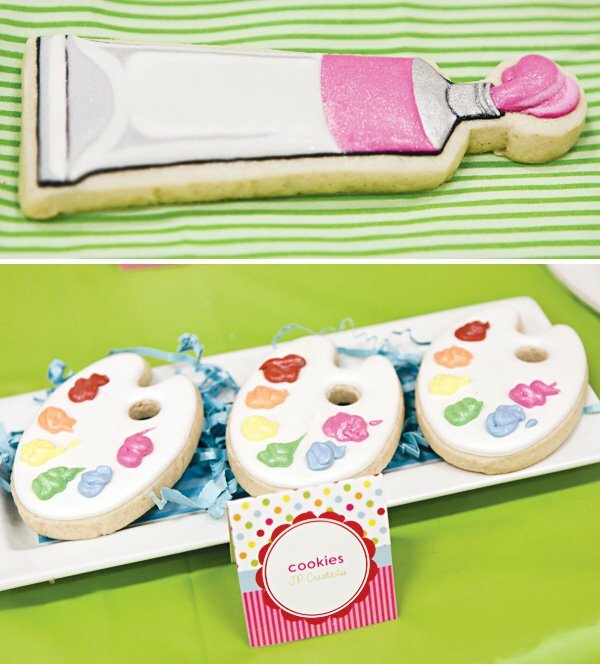 Love everything… from the custom invitations and aprons to the art-inspired cookies and treats! Cuqui me mato! que Brutal! 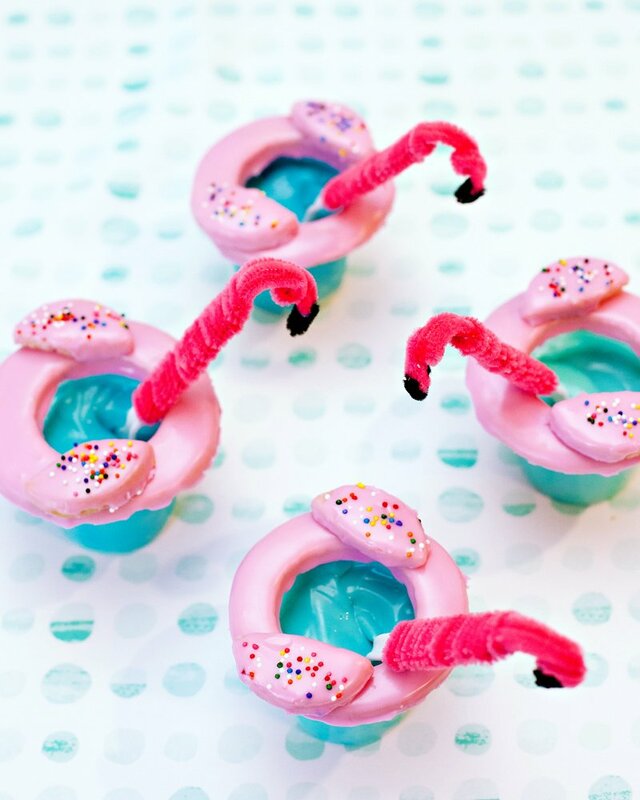 This is HANDS DOWN the cutest, most creative party that I have seen! WOW simply Beautiful!